When I visited Japan, I was expecting fantastic ramen, fresh off the boat sushi, crazy fashions, and crowded walks through Shinjuku. The last thing I was expecting was to be drinking the best drip coffee I had ever had sitting at a tiny, four-person noodle bar, listening to Rastafarian music in a suburb of Tokyo. 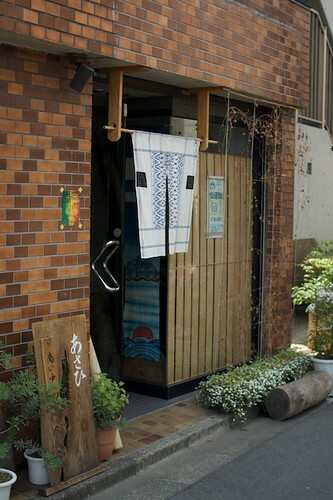 Ital Soba is located within a short walk from the Higashi-Kitazawa stop at the Odakyu line. It takes a transfer from the convenient Tokyo JR line, but trust, me, it’s worth it. Because of my initial confusion with maps in Japan (they’re oriented relative to what direction you’re looking in, not north/south/east/west like I was used to) I had to step into a veteranarian’s office to ask directions. A nice man who was waiting accompanied me out and actually walked me to the location. Talk about friendly, helpful locals! The restaurant itself is tiny and hard to spot if you don’t notice the small Bob Marley card taped to one wall. Owner Koichi Nakajima was just setting up shop, so Will and I thanked the man who walked us there and entered. The interior contained a small bar overlooking the house-sized kitchen and three or four two-seater tables. With my broken Japanese, we managed to order soba in cold broth for Will and a zaru soba for me. Everything is made to order there, so we got to watch the master at work. There was no rushing this soba. 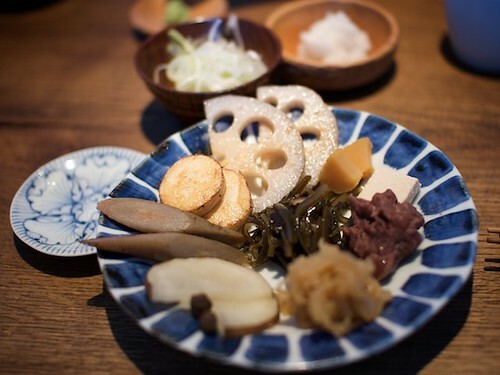 Nakajima first whet our appetites with a plate full of vegetables which were beautiful in their simplicity. Grilled slices of lotus root, sliced burdock root, a seaweed salad, some macerated adzuki beans, the appetizer set atmosphere of the noodles to come. 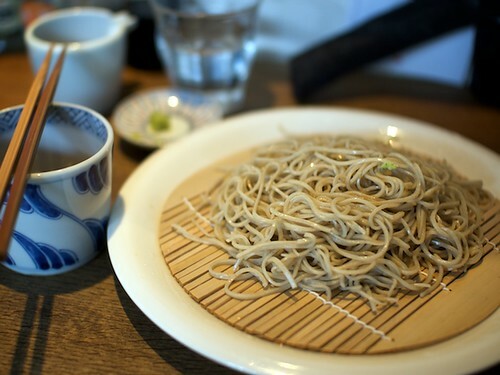 When the soba came, we were instructed to pick a dipping cup from a drying rack sitting on a stool in the corner. The cups came in a variety of shapes, sizes, and colors. 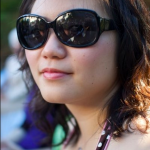 Being able to personally choose one added to the comfortable, home-like atmosphere of the restaurant. As expected, the soba was cooked perfectly, meticulously, and still retained a nice chew. The dipping sauce, enhanced by the grated radish and freshly grated wasabi, coated each strand of noodle sufficiently without being too salty. 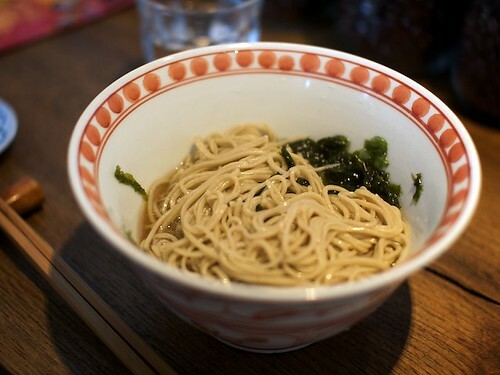 Zaru-soba is a simple dish, but it’s exactly that simplicity that shows how much care and attention Nakajima puts into preparing everything that exits the kitchen. The soba in cold broth was also prepared well, with tissue paper-thin pieces of seaweed lending a welcome umami taste to the broth. Since everything on the menu is vegan, Will slurped up the bowl with confidence that there was on hidden flake of bonito anywhere. 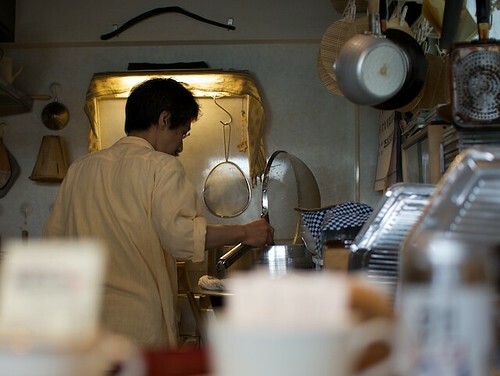 Like the noodles, great care was put into preparing the coffee. Nakajima delicately held the top of the chemex filter over a mug as he slowly poured a steady stream of boiling water onto the grounds. It took a few minutes, but the brew that I sipped blew my socks off. It had a strong, rich aroma and tasted incredibly smooth, without any hint of astringency or acridness. I always complain that brewed coffee never tasted as good as it smelled, but I think this came damn close. 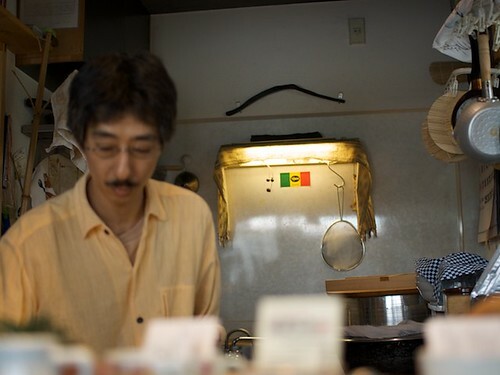 Even though it was a difficult to find, a bowl of noodles (or two in Will’s case), a fantastic cup of coffee, and getting to watch a master at work, is definitely worth visiting Ital Soba in my books. Hi! 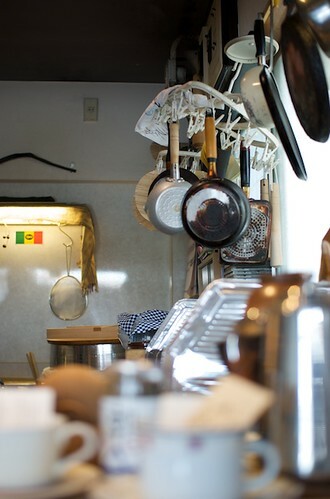 I’ll be going to Tokyo this May, and I was wondering what’s the price range for Ital Soba? It sounds like a fantastic place! Eileen, when we went it was about $9 a bowl, I believe. Definitely get the coffee too if he’s still doing that. It might have been a little more than that. He makes you some side dishes too, though. It’s really hard to find (and it’s a bit out of the city proper — I think it’s in a suburb), but it’s a unique experience. Thank you all for the replies! I just returned from Japan, but due to lack of time we didn’t get to try out this place. I’ll be sure to visit this shop when I go to Japan again in the future!